Boston Princess Party, celebrating ten years of service to Massachusetts, New Hampshire, Rhode Island and Eastern Connecticut, is a wonderful source of themed entertainment for birthdays and children's events. Whether at home or at a community venue, our beautiful, professional actresses make a dazzling appearance and put on programs that are loved by the kids. Boston Princess Party programs are designed to engage the children's imagination and create a magical, memorable experience. We offer a rich selection of characters in addition to the classical fairytale personas, making it easy for parents to plan exciting and unique celebrations. Boston Princess Party now provides characters for the boys, such as super heroes, pirates and movie icons. Please browse our website to view the many options available. Boston Princess Party programs consist of fun filled activities skillfully run by our experienced actresses. After a warm meet and greet in which special attention is paid to the birthday girl, our princess usually starts out with a lovely singing presentation. Party games follow that and kids three years and older catch on quickly and delight in the playful atmosphere. A Boston Princess Party programs includes balloon art and face painting for groups of twelve or fewer. The princess creates simple sculptures such as, swans, flowers or wands for the girls and swords for the boys. Fanciful face painting designs are rendered one by one for each child as the princess interacts in her charming way. The Boston Princess Party 1 ¼ hour program also features a lively photo session with the parents directing the shots. And as the party comes to an end, the princess leads the Happy Birthday song to honor your daughter on her special occasion. Boston Princess Party Programs can be customized to meet the needs of your event. We offer 2 hour programs which include: party games, face painting, balloon art, photo session and cake ceremony which will accommodate up to 20 kids. If your group is over twelve but no more than twenty, you may opt for the 1 ¼ hour program, but eliminate either face painting or balloon art. 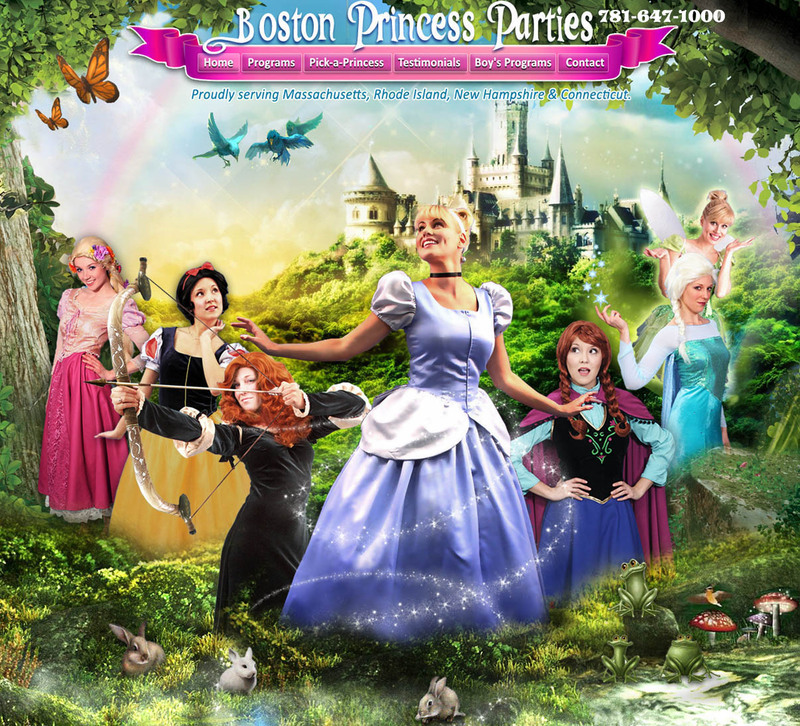 Boston Princess Party can provide more than one character for larger events and adjust the activities. Boston Princess Party Diva programs for older girls are a popular choice. Dancing, singing, play acting the role of a super star during a photo shoot are all part of the fun lead by our diva actress. She will also face paint everyone for groups of twelve or fewer. Boston Princess Party provides dynamic programs for the boys featuring all their favorite character. Please check out the photo gallery and program description here on our website. Our professional actors do a wonderful job conducting the parties for kids as young as three up to ten years old.